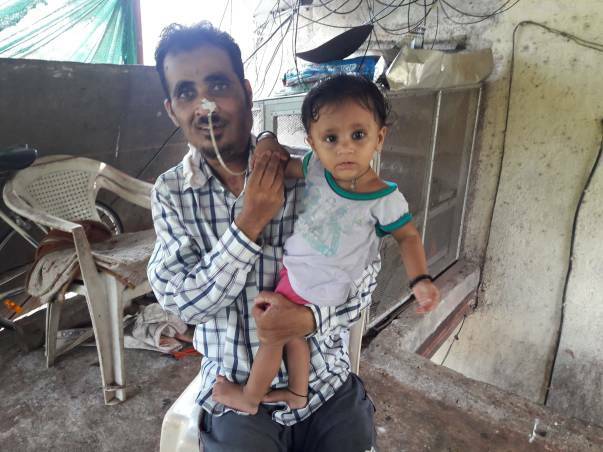 Ramesh Yadav urgently requires undergoing 2 surgeries in order to live and have a chance at getting back to his family and his newborn daughter. These surgeries are to first remove part of his now-decayed jaw and then re-construct his jaw by taking a bone-graft from his leg. 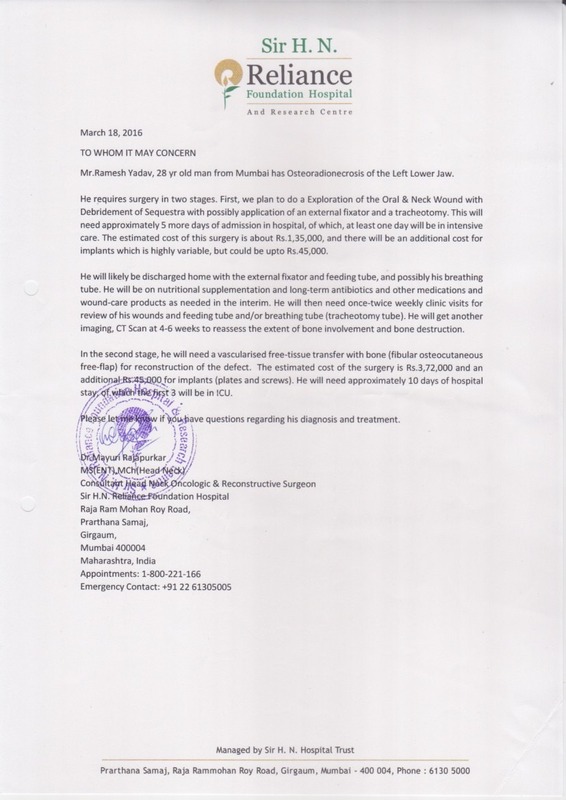 If the surgery does not happen, he will not be able to survive very long as his jaw will eventually collapse. Until then, he will pretty much be invalid surviving with a tube in his nose to help him eat and a tube in his throat to help him breathe. Ramesh has been my trusted driver for close to 5 years now. A hard-working and disciplined guy focused on building a life and family, he has no vices and had even given up chewing tobacco more than 10 years ago. He came to Mumbai to try and build a better life for himself and his family. Apart from sending money home on a monthly basis, he saved up for a few years and recently built a new house in his village for his family, which included his wife and old mother. In late 2014, he brought his wife to Mumbai to help her try and continue her studies, as that was not possible in the village. A few months of her being in Mumbai and their lives changed forever. He was diagnosed with Grade 4 mouth cancer in March 2015 only a few months after learning that he was going to become a first time father. Given the size of the tumor and the complications around it, it was imperative to act fast. The tumor at the base of his mouth was removed via a big surgery and subsequently he underwent 60 sessions of radiation. Ramesh has endured and successfully fought back against this dreaded disease. The cost of all of this was taken care of completely from my own funds (close to Rs. 5 lakhs) and with the help of some contributions from my friends and well-wishers. This is not counting the regular monthly salary and other expenses that I took care of during this entire time (even when he was not at work for about 6 months) and which I still continues to pay since he is once again unable to work due to new complications related to his illness. Today, while his cancer has been tackled, there is a new issue to deal with - Osteo Radio Necrosis for which he needs to undergo the 2 surgeries, which will remove and replace the necrotic bone in his jaw. This will then have to be followed by dental reconstruction; voice exercises and much more to get his mouth back as close to normal functioning as is possible. Getting back to health post all of this will take him close to a year minimum. Post that if luck is on his side he might be able to breathe, eat, speak and use his mouth like a regular person. These new rounds of surgery are to help prevent that and try to help him lead a normal life. In addition to this, he will need to do regular scans, MRI’s and other tests to keep a check on his cancer. Ramesh hasn’t given up and wants a normal life; it matters to him to be a good husband and a loving father, who provides for his family. You can help him get there by providing him with the financial aid to make this happen. Help us raise the funds to ensure that this round of treatment and his post operative care is can be managed properly. He is all that his family has and we anticipate that there will be further rounds of treatment. Ramesh deserves a chance at life. He is a good guy dealt a bad hand. He is a caring husband and son and a devoted father to his lil daughter. I am Ibrahim, a Milaap Open Fellow. I recently met Natasha and visited Ramesh’s house with her to get an update on his health. Ramesh was at his home, with his mother, wife, and nine-month-old baby girl. His daughter’s birth took place just a couple of months after his cancer operation. 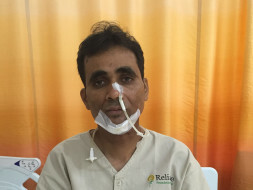 Ramesh had battled a plethora of medical complications even after the tumour treatment. His current treatment for Osteo Radio Necrosis has just been completed. He has undergone a jaw replacement surgery at the Harkishandas Reliance Foundation Hospital. The doctors have taken skin, bones, flesh, and even veins from his lower leg to replace his necrotic jaw. It was a complex procedure lasting almost 16 hours. He was kept in the ICU for three days. Post that he was still admitted in the hospital for 15 days so that he could recover and learn to walk through physiotherapy sessions. Fortunately for Ramesh, his cancer has shown no sign of relapsing. Although it is early to tell, but it seems that the new parts are being accepted by the jaw and it is healing and growing. Ramesh has to go a long way before he can lead a normal life, but with the help of his employers, family, and his daughter, he is confident that he’ll fight back no matter what.